Where are your crown jewels? Knowing where your crown jewels are and how to protect them is essential to crafting, implementing, and maintaining a computer security program. I recently visited the Karlstejn Castle in the Czech Republic, where the first instance of biowarfare took place with corpses being catapulted over the walls of the castle. 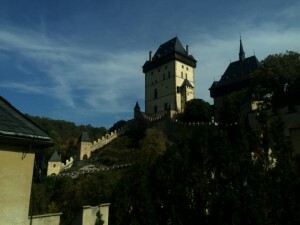 It’s a well positioned castle south of Prague, in a mountainous region with steep rock walls on one side of the castle. They created their own secret water supply for the castle enabling them to withstand long battles. In this picture you can see two towers with a wooden bridge (largely obscured by a tree in this image) connecting the two towers. In the event of a breach to the first tower the wooden bridge could be burned so that enemies could not easily breach the second tower. I’m told this is where the phrase “burning your bridges” comes from. When Germans occupied the country in WWII the crown jewels and a special book were both stored at the Karlstejn castle, in the second tower, where the walls are thick and the security is at a premium for the design of the entire castle complex. After the war the crown jewels and other valuables were able to be moved back into Prague. When it comes to your computer security do you know what are your crown jewels? Is it your proprietary recipes, formulas, R&D, innovation, PII of clients or patients, skilled staff, or your banking information? Identifying your mission critical assets and functions is a core component of a solid security program. Taking steps to plan ahead, audit, and protect your critical assets is clearly seen in the example of the crown jewels and the Karlstejn Castle story above. Are you ready for a possible network intrusion? Do you know what is most valuable, where it is, and how it might be captured, stolen, or damaged by an adversary? Do you have a backup plan in place for a war time event? Is there a continuity plan in place for a worst case disaster scenario? Applying this on a simple practical level one can consider ransomware such as CryptoWall and CrypoLocker. If such malware infects your host it will likely encrypt documents that matter to you, really matter, and documents on mapped network drives. At home are you ready for your personal files to be wiped out like this? Do you have a backup in place? What is the most important data on your computer in case of a disaster? For me it’s family photos and then various types of work data that I would not want to lose. I’ve got a portable large storage USB drive where periodic backups are made so that – just in case of a ransomeware type payload or critical hard drive failure takes place, I can recover everything that’s critical for legacy restoration. I still have my traditional daily backups in place on other drives, but this drive is for destruction on my host and/or network, so it’s not plugged in except for when I’m doing periodic backups for disaster recovery planning. You can improve your security posture by asking yourself what are your crown jewels and assets in the organization? How can you protect them? What puts them at risk? Where are they located and how might threats impact them? Start with what matters most and then branch out from there to best position your company and home network for success in the event of a major threat or disaster.